Πατήστε τη φωτογραφία και δείτε όλες τις φωτογραφίες του Holiday home Balchik Kvartal. Διαθέσιμο WiFi σε όλους τους χώρους, Εξωτερική πισίνα, Κλιματισμός. Holiday home Balchik Kvartal is set in Balchik. The property features sea views. The 6-bedroom holiday home comes with a living room with TV, and a fully equipped kitchen with microwave. The Palace of Queen Maria is 1.7 km from Holiday home Balchik Kvartal, while Botanic Garden Balchik is 1.8 km from the property. 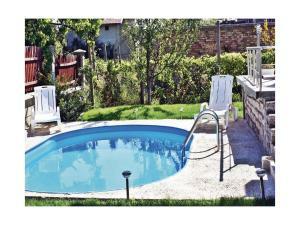 The nearest airport is Varna Airport, 47 km from the property.